Many years ago we started to dream of a year away, just our family. My husband, our three small boys and myself. This was not because we were unhappy with our lives and needed to get away, but simply because we valued our family and wanted to better appreciate what we had. We wanted firmer, closer family bonds and to show our children and each other how much we valued these relationships by taking our time, effort, finances and mental resources to make this dream happen. To overcome obstacles, to challenge ourselves, to be inspired, to learn and to achieve personal growth. We wanted the time to listen; to ourselves, each other and the world around us. 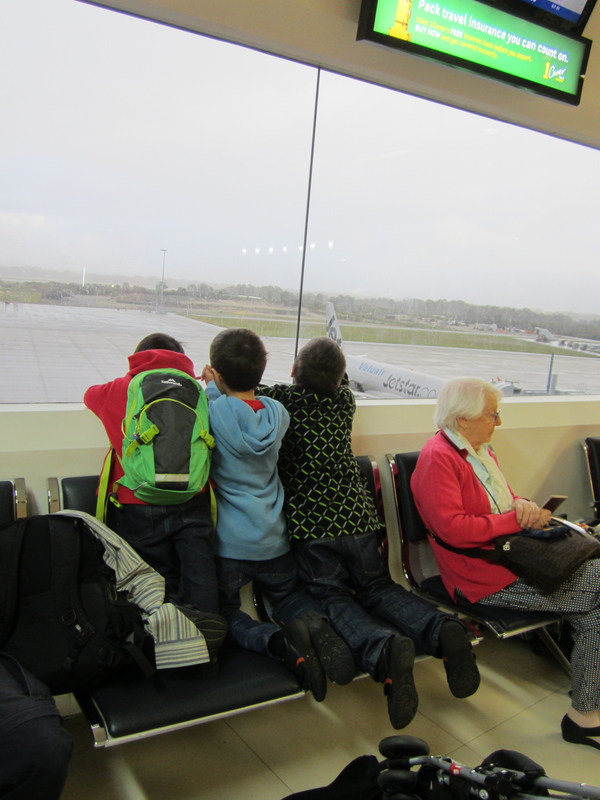 Excitedly waiting to depart for Singapore at Perth Airport. We wanted our boys to know at an early age that dreams can become reality and life paths are often choices. We wanted our children who were growing up in a materialistic, consumer, media influenced world to be touched by real people, real experiences and real places. To meet children who did not have the things that they had but were wrapped in the warmth of community, peaceful in the embrace of spirituality, confident in their ethics and just plain happy in the sheer joy of friendships. To look outside of their world and their lives and learn from the languages, culture, history and differences in this wide world. To empathise with those who had less and help them, not for any gain but simply to be compassionate and care. To know there were things more important than the next new toy, the next fun excursion or the next materialistic good. We felt that they could not learn this lesson at home in Australia which (we realise some may not agree) is a very privileged society. My husband was due for long service leave in 2012. So we thought maybe then we could make it happen. In 2010, after several failed attempts we set off on our first family trip to Vietnam. We took my mum and brother with us. It was a wonderful experience. In 2011, I went solo to Myanmar for charity work. In early 2012, I had a serious knee injury which postponed our gap year departure date. In 2012, we also set off on our second family trip to Singapore/Thailand – just us this time. Also a great experience. So after these trial runs, several negotiations and re-negotiations with several bosses over several years by my husband, a review of our finances, home renovations, enrolling the boys in SIDES (Australian Distance Education) and huge amounts of research – we finally set off on our big adventure on August 26th, 2013. We hope you will enjoy reading about our adventures and reflect on your own dreams. The best time for positive change is now. We are passionate about travel but we believe you do not need to travel to instigate real life change. The true journey of life is in the heart, soul and mind. A great start to an epic adventure. I look forward to more tales. Thanks Neil. We will try to keep them coming. Thanks Pommalada. It’s nice to have you join the sabertoothed chickens. Fantastic adventures – and very well written. Lovely to read about your experiences, travelling experience is such an enrichment. Thanks for reading and your kind compliment. We enjoy having you along on our adventures. Keep following our blog and commenting.